The precise channel of the river is under dispute over the upper part of its course, and it seems to have had two branches in the Norwood area, flowing under Half Moon Lane in Herne Hill towards Coldharbour Lane, Brixton then Brixton Road on to Kennington and then ending in the Thames, near Vauxhall Bridge. The upper part of the Effra’s course was often nothing more than a stream unless there was heavy rainfall but along Brixton Road to the Thames the course of the Effra was wider - Its average size there was said to have been 12 feet wide and 6 feet deep. The Effra is joined by another tributary near Brixton's Effra Road, whose source is in nearby Brockwell Park. Today’s Effra Road follows the boundary of the old Effra Farm and not the actual course of the river (which ran through the farm). There are two possible explanations for the name Effra. The first is that it is derived from the Celtic word for torrent (given by the pre-Roman tribes) and the second is that it comes from an old London re-pronounciation of Heathrow, as the river flowed through the Manor of Heathrow in Brixton. There are rumours that Queen Elizabeth sailed up to the river in a barge to visit Edward Alleyn (a famous Elizabethan actor) at his manor in Dulwich, though this is unlikely as the Effra was not wide enough for a barge this far upstream. Cnut The Great is said to have sailed up the river as far as Brixton during the Danish Conquest of England around1016. The19th century painter and critic John Ruskin, who grew up in Herne Hill, said that his first sketch showing any artistic merit was at the foot of Herne Hill (where the Half Moon Tavern is now), showing a bridge over the Effra. He described a nearby stretch towards Dulwich as a “tadpole haunted ditch”. The Effra was covered over as a sewer in the mid 1800’s. In Victorian times a coffin was discovered floating in the Thames and was found to have come from West Norwood Cemetery although the grave was undisturbed. 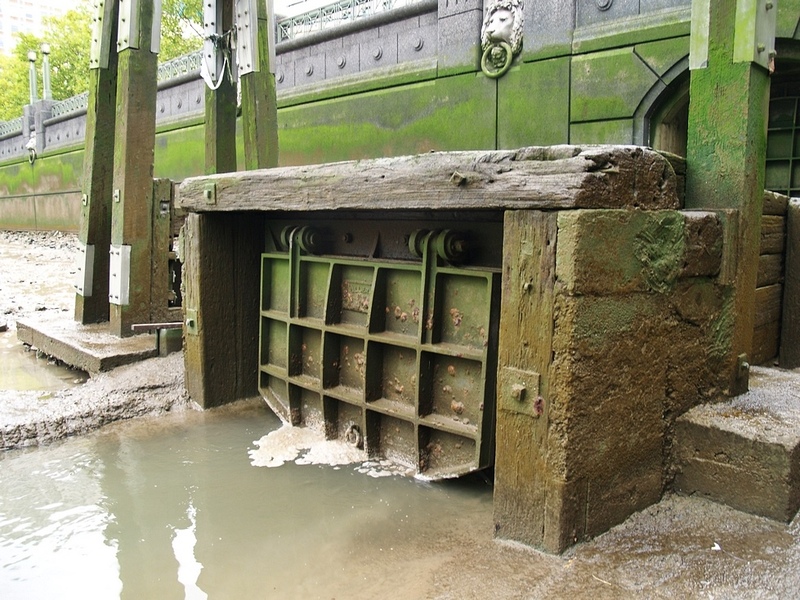 It was said that the grave had been dug too close to the course of the Effra, which runs beneath the cemetery, and the coffin had subsided into the river, flowing underneath south London before reaching the Thames at Vauxhall. The raised banks of the Oval cricket ground were built with earth excavated during the enclosing of the Effra, which showed itself again and was responsible for flooding the cricket ground in the 1950s. Close to the source in Upper Norwood Recreation Ground there is a small cul-de-sac and at the end is a drain with water believed to be the Effra rushing loudly underneath. Just past here the river ran through the grounds of what is now the Virgo Fidelis convent school. Most of the brick wall of the convent was swept away in 1890 when the river and West Norwood flooded –the repairs are still visible in the existing convent wall. The landscape in the area from here to West Norwood towards suggests at least a rough course for the river. After a three hour long storm in 1914 the sewer overflowed again and flooded houses along its path in West Norwood, and locals were forced to evacuate their homes for several days. It is claimed that some people’s Sunday joints were washed out of their ovens from the area around Pilgrim Hill. Some old buildings still stand in this area including the “Boat House.” There were further floods in the 1920s & in 1935 the sewer was enlarged to help avoid the repeated floodings, and deep shafts were sunk in Norwood High Street This was sufficient until the local area was flooded again during a powerful downpour in 2007. The mouth of the Effra used to be under what is now the St George's Wharf development the site was referred to as the Effra site during the thirty years that it remained undeveloped. There is still a small outlet in the river wall south of Vauxhall Bridge.The larger outlet adjacent to the north of the bridge with the new nameplate for the River Effra in front of the Security Service (MI6) is actually the more recent Effra storm relief channel. In 1992 a project by the London arts group Platform sparked a local campaign to dig up the river. The 'Unearthing the Effra' project was based around a mock 'Effra Redevelopment Agency', which included a public office. You refer to a body, in a coffin, found in the lower reaches of the River Effra, having been washed out of the Southern Metropolitan Cemetery at West Norwood. I understand that the Cemetery pre-dates all developments in the area, including the Church opposite the entrance. The only the exceptions were the Northgate into the forest and the Horns Tavern, which was moved somewhat to the North when the railway was built. There used to be a builders merchants close by the cemetery on The Norwood Road. In the late seventies I knew a man who worked there who told me that when they were doing some repair work to the cellars under the shop they discovered some coffins and bones, which they rapidly covered up. - I might have had my leg pulled. - The boundaries and documentation of the early cemetery may have left a lot to be desired. - People who could not afford plots inside the cemetery may have buried their loved ones outside the boundary of the cemetery. These may have been to close to the river Effra, and one of these may have been washed away. Others who might have been buried outside the cemetery might have been suicides and people who were not members of the CofE. - Washing away of coffins and redeposits by the river Effra may have been more common than thought.